I want to preface this post by saying I love my job, and it's because I love my job that I feel the way I do. The intention of this post is to demonstrate the real world environment one finds themselves in while working in the world of big supermarket chains. This post isn't meant to insult, degrade, or vilify anyone, but more importantly as a satirical look at the mundane world of supermarkets, and all the not so common sense policies and rules that make up that world. I'm not sure how many people are aware of all the policies that supermarket employee's need to sign off on before their allowed to work. It's easy to understand a companies position on policy\rule updates, as many are mere refreshers. From time to time wording of these policies\rules undergo slight changes, while most of the changes are grammatical in nature, other times policy\rules changes hint at being more madness than method. While I often question these changes, unless I want to end my employment, I'm forced to comply with these policies\rules. Is signing this document legally binding? (Meeting of the minds (also referred to as mutual agreement, mutual assent or consensus ad idem) is a phrase in contract law used to describe the intentions of the parties forming the contract. In particular it refers to the situation where there is a common understanding in the formation of the contract). So if I don't agree with the policies\rules, and there is no mechanism for changing the wording to reflect my disagreement, how can this be a binding document. (Duress is pressure exerted upon a person to coerce that person to perform an act that he or she ordinarily would not perform.) In other words then if I don't agree with the policies\rules and there is no way to indicate my disapproval, but I'm forced to sign off on them anyway, I would then be signing under duress. That's my view on it, maybe someone with legal insight can make comments on my above statements? While I continue to ask these questions, the answers will not be found by asking my direct supervisors, not store management, not from union (shop stewards) representatives (at least the ones I've asked). It appear to be a case of we'll cross that bridge when we get to it approach to management. Note (1) : No official document heading. To me it's really strange this document exists, or if it's even coming from corporate headquarters. No one seems to want to claim it as theirs, and even the punctuation throughout seems somewhat shady and illegitimate. The lack of page numbers, and the fact we're unable to get copies of signed documents is another red flag screaming foul in my head. Note (2) : Colleagues? What the heck, if this is really coming from corporate headquarters then call us what we are... employees. We are not colleagues, we are not on the same level, we don't work together, you don't listen to my concerns and act appropriately. I'm an employee who the company really doesn't know exists, I don't get invited to Christmas dinner, you don't send me a Christmas card, there is no Christmas party (or any celebrated holiday party, I'm not religiously intolerant after all), or Birthday party, or Birthday cake, we don't car pool, and we don't eat lunch together so don't make it weird by calling the relationship something different than what it is. I'm an employee. Ask every customer "Is that everything from the bottom of your shopping cart"? (4) You must also physically check. When customer walks through your checkout, be sure to view the mirror to double check that the customer has not overlooked anything. If unable to view bottom of buggy, you must walk around and physically check. Note (3) : It's weird how they try to make all these policies\rules seem cool, by calling them by code names, Like BOB is going to make it easier for us to do our job. Also you know how strange this sounds in conversations? Oh my, and try working BOB into a sentence without laughing, have you done BOB today, make sure all staff does BOB today. With BOB, LISA, and MITCH you would think staff were involved in some sort of sexual depravity. Note (4) : Do you know how difficult it is to ask English is a second language people "is that everything in your cart?" I've had days when half a dozen customers would go through my till and not one answered any of my questions. I'm an outgoing guy, and its so demoralizing continually reciting these speeches and no one even acknowledges me. Oh and like the guy or gal who's stealing a roast, by hiding it on the bottom of the cart, is actually going to admit they're stealing. No what they do is ignore you, and if you spot it they say, oh I forgot. So why do I even have to ask, it's not like they get a fine for lying. This just compounds the disrespect people have for cashiers. Now if there was punishment for getting caught without paying for something, then maybe people wouldn't be doing it. On a personal note I can't tell you how many times a day I catch people trying to go through the checkout without paying for something, and even more at u-scan, and why not, there's nothing I can do, except take the item away. inside to ensure there are no items concealed and be sure to remove all stuffing from purses, etc. Note (5) : This is a policy/rule that really bothers me, because is somewhat leaves the cashier vulnerable by its wording. From the best of my knowledge I believe that, I have no right to search the possessions of anyone, and doing so could be a criminal offense. The way the policy reads is that we can search unpaid items that we believe the customer is buying, but what if the item was already paid for previously. Then are we then committing a crime by searching their items. How is a cashier supposed to know if that sweater that is missing tags has been paid for, or if the customer simply removed it because they were hot. Oh and like I'm going to ask every one that comes in with a purse if that is their purse, that's ridiculous. Sure lots of people grab things off the shelf and start eating them, and I can ask for them to pay, but if they refuse, then what? So if I assume all items carried by customers has been paid for, then I don't have to do anything? Note (6) : What if I do search an unpaid bag and find something inside? Obviously the customer is going to deny they put it in there. Once again the customer is not held responsible. Maybe the LPO (Loss Prevention Officers) should be video taping the stealing customers, so we could prosecute some of these thieves, instead of putting the blame on the cashiers. It's all the cashiers fault for product shrinkage, never the stealing customers, and definitely not LPO fault. What if we made a rule that all LPO staff would be fired every time inventory came up short. It's sort of the same isn't it? Note (7) : Have any of you ever tried asking a new mother, or new father, who has screaming kids, and is losing their sh@t at the check-out if the cookies the kids are eating have been paid for. Let me tell you from experience you'll do it once and once only. Plus we have a cookie give away promotion for kids in the bakery, teaching kids at a young age its OK to take things without paying for them. I've haven't seen a "get a free cookie" card in years, yet all day long cookies go through my lane. Note (8): Yeah like that's going to happen. Once again there is no way for a cashier to verify if something has been paid for unless the customer has a valid receipt. If the customer says they brought it with them, I don't think there is anything the cashier can legal do. We can call LPO but I get the same answer every time "unless we have the customer on tape picking up the item and walking through the checkout without paying, then they can't do anything". So, if LPO can't enforce this policy\rule how are cashiers supposed to enforce this. Note (9): Since when do the descriptions on screen ever make sense. It's hard enough to get a message out on Twitter using 140 characters, try describing something in 12 characters or less. O couscous, is that O as in Original or O as in Organic. Note (10) : Bulk items, makes my chuckle every time. Like I'm going to be able to determine the difference between organic couscous and original couscous. It's bad enough I have to memorize the hundreds of items in produce, you want me to memorize what every bulk item looks like and its corresponding code. Also, sorry to annoy anyone working in bulk, but those people in bulk make so many mistakes. Putting the wrong product in the wrong bin, miss labeling items. It's so difficult to truly know what's going on in that department. But obviously the customer was stealing, and we call for a price check knowing full well almonds aren't $.10 a hundred grams. But wait the price checker returns, and the bin number the customer used was right. Oh sh@t, now the customer was right and they are pissed. Once again the cashier is enemy number one, because we enforced the rules and the rules failed us. Maybe LPO should be focusing their efforts in other areas of the store (like the bulk department) instead of us cashiers. While Bulk is the most notorious violator of price\coding violations that I've seen, all departments could use some help getting into shape with regards to pricing\code procedures. Note (11) : So I know the code for almonds, but my customer isn't going to buy that bag of almonds for $15. Customer: "oh wait it's not $.10 a hundred grams, and that bag of almonds if going to cost me $15, Yeah I don't want it." Once again there is a pattern, even if the cashier uses the right code and prevents a customer from stealing, their is no repercussion to the customer. In fact that customer will probably make note of who we are and just go to someone else next time. Something I see everyday, and why don't we try to keep on top of unscrupulous customers who will always target the newer, less experienced cashier to get away with their fraud. The customer is always right, that's why. Note (12) : For those that aren't aware purple is the colored used to indicate an organic item. When we first started carrying Organic items they had completely purple labels, so cashiers could easily identify them. Recently however the labels have been showing up looking identical to it non-organic counterpart, with the only difference being purple colored numbers. So what happens if the label falls off, or the customer removes it? From experience I know the difference with some items, but if the customer lies and insists it not organic, I have to give it to them for the non-organic price. Note (13) : If LPO were really concerned about product loss or shrinkage, then why don't they recommend hiring a grocery person to put items back at the end of the night. There are some days when I start work that we have carts and carts of food that hasn't been returned to the shelves. Sometimes there is spoiled dairy, cheese, meats, deli items. 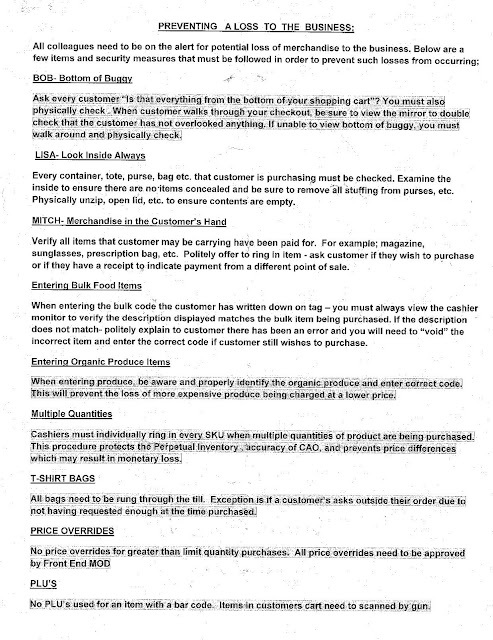 You want to reduce shrink start there, don't say LPO needs more money to watch cashiers, and make these silly rules. There can be hundreds of dollars in product being thrown away because it wasn't properly returned to its department, and yet that never get's discussed. Note (14) : This is probably the most challenging and difficult policy\rule to adhere to, specially when your working by yourself (which is every morning) where you have long line up with restaurateurs, corner store owners, and service delivery agents shopping. Restaurateurs, corner store owners, and service delivery agents tend to do massive size shopping with carts full of multiple items. This is the beginning of their day and they usually just want to get through the check-out as quickly as possible (not that every one doesn't dread standing in a check-out line). Since this is their job they usually have time constraints which leads to them getting quite agitated with this every item must be scanned policy\rule. They don't want to empty out all 3 of their carts, because they just finished filling them, it's time consuming and lots of work. Most of their items are bulk buys, still packaged in cases and boxes which makes the scanning every item difficult, because you have unwrap and physically scan each item. Note (15): While this statement is true, it's not really an honest statement to make, and I'll explain my view. Perpetual Inventory means never ending inventory, but if you've ever been shopping at my store when something is on sale you know all to well there is an end to inventory. Ok so PI is a myth, its basically a way to reduce labor, by eliminating the position where in the past someone would physically check shelf stock and re-order when it dwindles down, or orders extra stock when sales are running. Now we have software, some artificial intelligence which uses the check-out information, and order information to know what is available on the shelves at all time. It also re-orders product based on this knowledge. I don't have as much faith in this software as my management team, but I'll explain my side and maybe they can explain their (if they choose to contact me). I am of the belief that people are better at understanding real world human behaviors that uniquely impact shopping habits (at least currently). Things like competitor sales ads, major sporting events, adverse weather conditions, moon cycles, seasons and government assistance payment cycles all have an effect on consumer buying habits. These unique situations also effect a companies ability to receive stock replenishment by hindered road condition, employee sick time. These are but a few things which I don't believe PI software tracks in real-time as well as people do (completely my opinion). Note (16): I'm not even sure what these initials stand for. Big supermarket chains seem to like doing this follow the leader game, where if someone implements something, we need to copy it, even if we don't know or understand what it is. Note (17) : Ok I totally understand this, but in reality, this makes up such an insignificant loss if any. What they are saying is that if a customer buys beef,pork or chicken flavor noodles even though they all cost the same the PI software wants to know so it can order replacement, I totally get this. However shrimp flavor noodles have a slightly higher cost than the beef,pork,or chicken flavor noodles. By scanning each and every individual package of noodles in a 24 pack case, we avoid the risk of accidentally charging the lower price when a higher price item is present. While this is a fair statement usually each flavor has a unique color identifier making recognition easy. Note (19) : This is one of the most frustrating things as a cashier, to have already asked someone if they need bags, knowing that they do and how many they will probably need, only to have them say no or a number you know is nowhere near their true requirement. Then to have to stop your next order, possibly half way through a case of noodles, to give free bags to someone you know was being dishonest, all the while losing your count on which package of noodles you just scanned. This is why in real world scenarios Note (17) is such a pain in the rear for cashiers, it would be more effective to count 24 and then enter 24, instead of scanning each one. However since PI hasn't been programmed to understand this it doesn't care, its a machine after all, dictated to by bean counters. No price overrides for greater than limit quantity purchases. (20) All price overrides need to be approved by a Front End MOD. Note (20) : This is so ironic, because it used to read NO GREATER THAN MULTIPLE ORDERS. 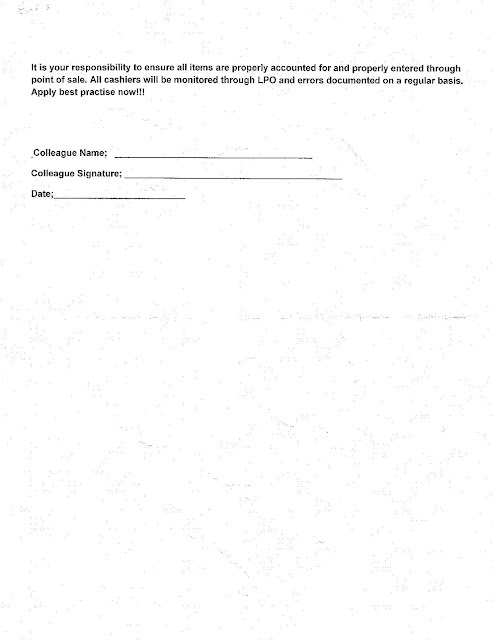 There was a similar document I was required to sign that said I would not, under any circumstances allow customers to purchase more than the limit allowed. This was a few years ago when PI was first implemented, and I assume the software and bean counting team couldn't come to terms with so much product turning over while sales remained stagnant. Instead of people buy multiple items on one order, their buying habits changed to single items on multiple orders. So now, management is saying that PI has finally learned peoples buying habits, and in order for PI to continue understanding this habit, the cashier must adapt to the software. Having been trained in computer programming, to me this is pure programming laziness or a complete shortfall in the PI software's ability, which is unlike a person, who would easily understand this phenomenon. No PLU's used for an item with a bar code. (21) Items in customer cart need to scanned by gun. Note (21-a) : PLU's are short codes used by cashier for items that usually come without UPC's or hard to read UPC's (like bags of rice, with UPC's printed on them). Instead of trying to read and decipher these 11 digit UPC's we had 5 digit PLU's that resulted in the same product being entered. This policy\rule is another example of poor PI programming, instead of being able to track both the UPC and PLU together the PI software gets confused and orders incorrectly. So because PI continually gets confused cashiers are now being asked to no longer use the PLU's that made their job easier, and a more pleasant shopping experience for the consumer. Instead now, even though we may know the PLU, we need to only use the UPC, which may impact the customers shopping experience with delays due to needing a price checker's verification. Note (21-b) : There is another problem with this policy\rule that seems to have slipped by without management realizing it. All our produce is done by PLU, and none of the UPC's on produce are in the system, so we can't use produce UPC's as they don't work. So how can we actually follow this rule? Note (22) : The policy\rule and procedure around this item is currently transitioning, and we'll discuss this more in-depth on another post. 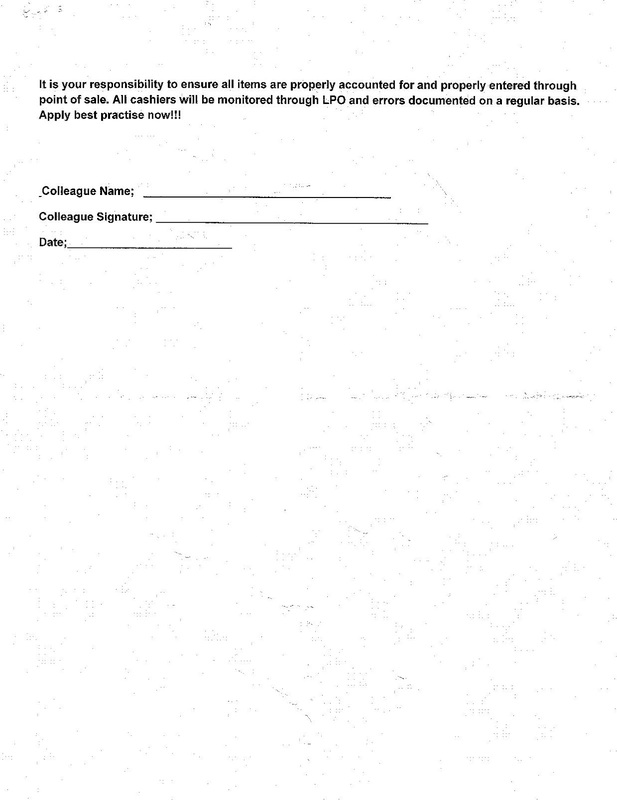 In closing it would seem this document was probably created by LPO desperate to validate the need for their services by turning on their colleagues, the cashiers. It's unfortunate because this document creates so much unneeded animosity towards cashiers and the job they do. I'm all for solutions to reducing loss to the company, and I'm all for ridding ourselves of unscrupulous cashiers, but targeting all cashiers as unscrupulous shouldn't be a solution nor the mandate. For those whom may question if this document is real or made up here is a scanned copy. I didn't expect to be writing this much and if you've stuck with me until here, I commend you.